The World Organisation For Animal Health Addresses Working Equines, Zoonotic Diseases, Rabies : Goats and Soda The World Organisation For Animal Health has adopted its first standards to provide good care for equines — part of a broad agenda at its just-concluded powwow. 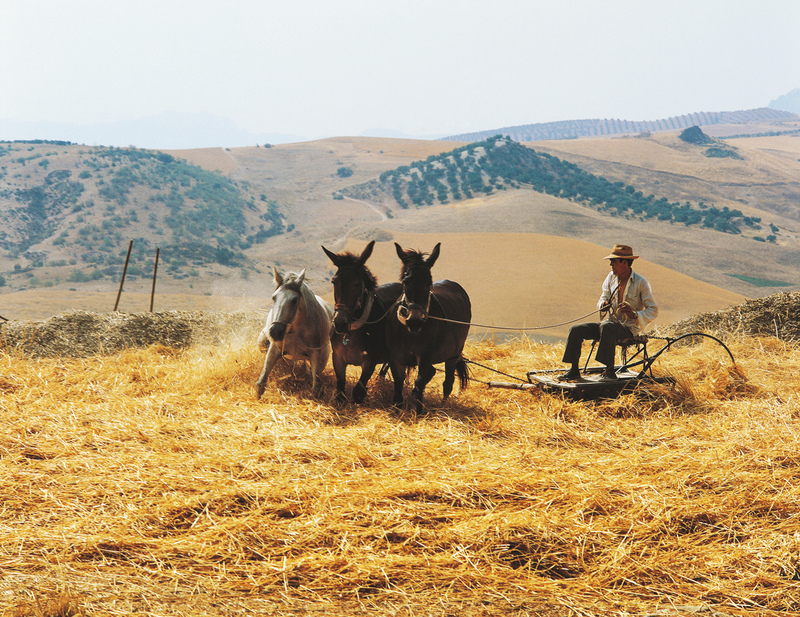 A horse and mules thresh wheat in Spain. The World Organisation for Animal Health has adopted the first set of global standards to ensure equine welfare. It's been a week of global powwows: the World Humanitarian Summit in Istanbul, the G-7 Summit in Ise-Shima, Japan, and the World Health Organization's World Health Assembly in Geneva. But if you happen to be a horse, there was really only one gathering that mattered: The annual general session in Paris of the World Organisation for Animal Health (or OIE as the body is known by its French initials). Before we get to the stakes for equines, it's worth noting that this year's OIE get-together – which concluded Friday – was just as focused on the homo sapiens among us. To find out more we spoke with veterinary doctor and OIE Deputy Director General Brian Evans. A member organization of 180 countries, founded in 1924 and dedicated to protecting public health by watching over animals. "You can't produce safe food from unhealthy animals," says Evans, and many animal diseases can cross over to humans. How does the OIE carry out this mission? Mainly by setting safety standards on an incredibly long list of issues around animals: how to safely raise, slaughter and transport all manner of livestock; how to keep wild animals from spreading diseases; and how to respond to animal disease outbreaks — hoof-and-mouth disease is a classic one. The standards are largely voluntary but can make a big difference: Over the last decade they helped the world eliminate a disease called Rinderpest that once killed cattle across Africa, Asia and Europe. "It's only the second disease in the history of mankind, after smallpox, to be completely eradicated," notes Evans. Just as crucially, he says, the OIE acts as an early warning system — alerting other health agencies to emerging "zoonotic diseases" — diseases with the potential to jump from animals to humans. Ebola, SARS, Middle East Respiratory Disease, avian flu, Zika and HIV/AIDS are all examples. How big of a threat are zoonotic diseases? Evans recalls that back when he was in veterinary school, students were told they could expect a new disease to emerge about once every 15 years. Today, he says, a completely new or hitherto obscure disease crops up "on average every six to eight months." What's an example of a current worry? Evans points to Rift Valley Fever, an often deadly disease that affects both domestic animals and humans. "It's currently indigenous to Africa. But it's capable of being spread by various insects." Climate change is expanding the areas where these particular insects can thrive. And that spells danger. "In the same way that Ebola moved out of rural Africa to urban Africa and then from there posed a risk to the rest of the world, Rift Valley Fever is not far behind." What other factors are behind all these new zoonotic diseases ? Globalization and the resulting surge in movement of people and goods across borders is a big one. But at the top of Evans' list is the clearing of forests and other wild land for human use. It's forcing insects, birds, and other disease-carrying animals such as bats to change their migratory patterns. This brings them — and the viruses and bacteria they carry — in contact with both each other and humans, creating opportunities for the creation of wholly new diseases. "You know, viruses are promiscuous. They like to breed with each other," says Evans. "So the disease we should be anticipating is the one we haven't even recognized yet. That's what keeps me awake at night." What is the OIE doing to protect us from this? A key focus is trying to get governments to take the threat more seriously. Unfortunately, says Evans, to the extent that governments have mobilized resources to deal with zoonotic diseases they've focused almost entirely on improving the health response for humans: making sure there are enough doctors, vaccines, and treatments. There's been comparatively little investment on the animal health side — for instance in animal vaccines or networks of veterinary professionals and labs that could investigate diseases while they're still confined to the animal population. Evans says this just amounts to addressing the consequences of an outbreak. "You're not preventing the outbreak from happening in the first place." So how do you get governments to pay more attention to the animal side of the problem? OIE officials think one answer will be to appeal to economic interests — pointing up the high cost of animal disease outbreaks. The agency commissioned a study for this year's gathering looking at the economic impact of animal diseases on its 180 member nations. The principal finding: "The sort of economic data that would be necessary to do good cost-benefit comparisons simply doesn't exist." What were the other hot topics at this year's Paris meeting? The challenge posed by overuse of anti-microbial drugs, which is fueling the rise of resistant strains. The OIE has been establishing a global database to track the use of these drugs in animals so that problem areas can be identified. It's also helping countries come up with national action plans, including model laws and regulations. Then there's rabies. Right now as many as 70,000 people worldwide die each year from rabies — in almost all cases contracted as a result of a dog bite. The OIE is helping to lead a global campaign to end all such deaths by 2030 by stepping up vaccinations and other forms of prevention. And finally, says Evans, this was a huge year for working horses. The OIE adopted the first set of global standards for ensuring their welfare. Topics covered include: What are the signs that a working horse is feeling stress or pain? How much water and rest should you give it? How long can a mare continue working while pregnant? Why so much love for working horses? It's actually part of a wider mandate. In the early 2000s — in response to growing international interest in animal rights — the U.N. tasked the OIE with coming up with standards covering not just the health of working animals but their welfare. "Since then," says Evans, "we've been going species by species, looking at best practices, consulting with animal behavior scientists and animal welfare groups." As a blog named "Goats and Soda" we feel obliged to ask: What about standards for goats!? They're in the works, Evans promises. "But they're not ready for prime-time yet. I'd say we're looking at a 3-to-5 year window."